UPDATE: These deals have now come to an end but Amazon.co.uk still has some brilliant phone deals to grab so its still worth a look. Well Amazon's Spring Sale is now coming to an end. Backed by a week of brilliant tech deals, there is now a host of offers ranging from Amazon.co.uk speakers to warehouse throwaways, giving us fond memories of previous Amazon Prime Days. While there is a lot to want in this sale, you do have to sift through a bit of everything to find the stand out offers. To make your life easier we've tracked down the items that are most worthy of your attention. And that's exactly the case with the Amazon Spring Sale reductions on Samsung's awesome Galaxy Note 8 and Galaxy Note 9 duo. So what are the savings? 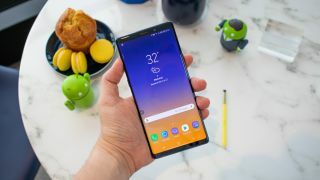 The most eye-catching offers come on Amazon's Samsung Note 9 SIM-free prices, where you can get £200 off the RRP of the 128GB model and a massive £250 off the starting price of the 512GB version. That means SIM-free prices of £699 and £849 respectively. Happy to go back a further year for a 2017-released Galaxy Note 8? Then the saving is even more extreme. There's a stated 39% off the usual price, bringing it down to under £500. That's an extraordinary price for a phone this good. So if you've been eyeing up new mobile phone deals and like the look of Samsung's Note series, now's the time to strike. The only question you'll need us to answer next is what the best SIM only deals to put in it are!